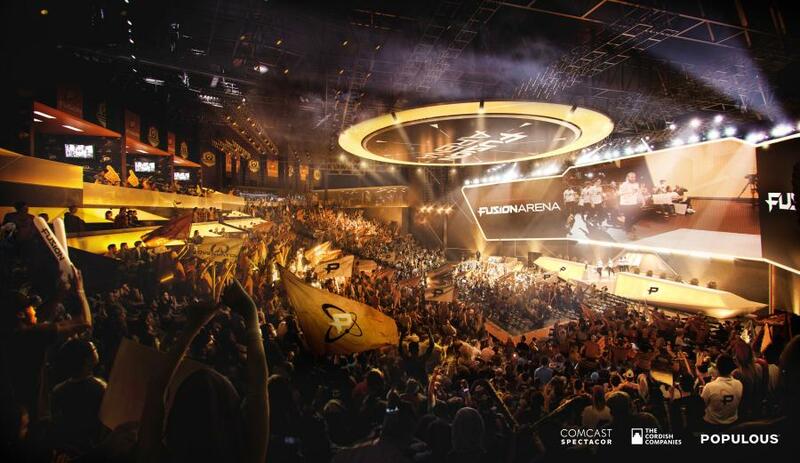 Comcast Spectacor and The Cordish Companies have announced plans for a $50 million, next-generation esports and entertainment venue in the heart of the Philadelphia Sports Complex. Adjacent to Xfinity Live!, the first-of-its-kind venue will seat up to 3,500 guests and stand as the largest new-construction, purpose-built esports arena in the Western Hemisphere. Its primary tenant, the Philadelphia Fusion esports franchise, is one of 20 international teams competing in the Overwatch League. In addition to serving as a premiere destination for competitive gaming events, Fusion Arena will also host a variety of live entertainment programming and experiences. "We're thrilled to introduce a venue like no other as we move forward with the next phase of development within the Philadelphia Sports Complex," said Dave Scott, chairman and CEO, Comcast Spectacor. "Fusion Arena gives esports fans a best-in-class venue to call home and be proud of. Beyond competitive gaming, it's a stunning facility that will host a wide array of events." Adjacent to Xfinity Live!, the first-of-its-kind venue will seat up to 3,500 guests and stand as the largest new-construction, purpose-built esports arena in the Western Hemisphere. "It is a tremendous honor for The Cordish Companies to grow its partnership with Comcast Spectacor and bring a state-of-the-art, world-class esports and entertainment venue to the heart of the Philadelphia Sports Complex," said Blake Cordish, principal of The Cordish Companies. "Fusion Arena will set the gold standard for competitive gaming and debut on one of the country's most exciting platforms of sports and entertainment amid Philadelphia's professional sports teams. Today's announcement marks an exciting moment for the Comcast Spectacor-Cordish partnership as the next phase of Xfinity Live! continues to unfold." 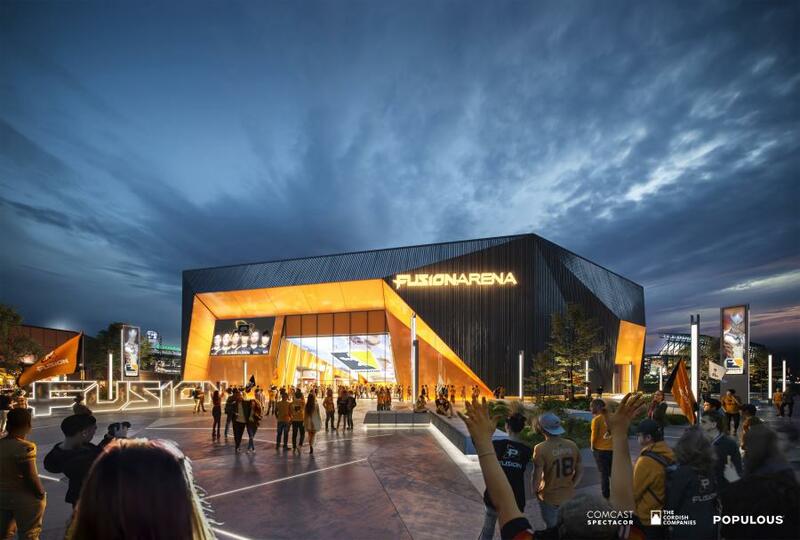 Designed by Populous, an architecture firm with deep experience in the fast-growing esports space, Fusion Arena will boast 60,000 sq. ft. of new construction, featuring a stunning and futuristic design throughout. Construction is set to begin this summer. "Fusion Arena represents a watershed moment for the competitive gaming market," said Populous Senior Principal Brian Mirakian. "We're taking our 35 years of designing iconic experiences for traditional sports – settings like Yankee Stadium – and applying those same principles of design to the virtual world of gaming." The incorporation of industrial materials throughout Fusion Arena's design pays tribute to Philadelphia's heritage as the "workshop of the world." Eliciting the venue's first wow is the arena's exterior, a sleek and dynamic skin that draws inspiration from the hardware powering esports' meteoric rise around the globe. The incorporation of industrial materials throughout Fusion Arena's design pays tribute to Philadelphia's heritage as the "workshop of the world." A captivating 6,000-sq.-ft. public entry will greet guests as they enter the space and includes 2,000 sq. ft. of interactive media surface hovering 30 ft. above them. The technologically-advanced arena will offer unique seating experiences including two balcony bars, club seats with USB ports, flexible loge boxes and exclusive suites. Additionally, nearly 10,000 sq. ft. will be dedicated to a training facility, broadcast studio and team offices. The training facility in particular separates the Fusion from the pack, offering unrivaled experiences and development opportunities for players. 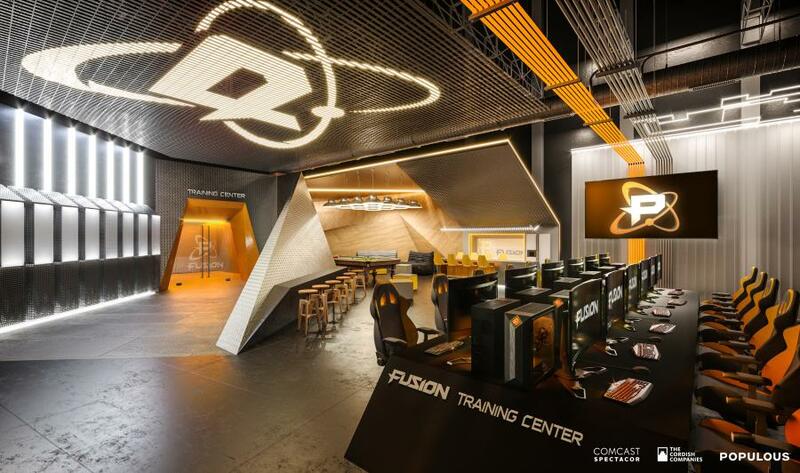 "We are thrilled to bring this ambitious idea to life and celebrate the arrival of Fusion Arena with gaming enthusiasts throughout the region and beyond," said Joe Marsh, chief business officer of Spectacor Gaming and the Philadelphia Fusion. "This project places esports alongside all the major traditional sports that call South Philadelphia home." Details for Fusion Arena arrive at an exciting time as the Wells Fargo Center is in the midst of "Transformation 2020," an extensive, multi-year $250 million renovation initiative. Fusion Arena adds $50 million of new development within Philadelphia's Sports Complex, complementing a transformed Wells Fargo Center, Lincoln Financial Field and Citizens Bank Park. Fusion Arena is the second of several announcements surrounding Comcast Spectacor and The Cordish Companies' real estate development within the Philadelphia Sports Complex, adjacent to Xfinity Live!. In February, the partnership announced plans for Pattison Place, an $80 million, new construction Class-A office tower. Since opening in 2012, Xfinity Live! has been a prominent dining, entertainment and hospitality anchor for the region, dramatically changing the fan experience for Flyers, Eagles, Phillies and 76ers fans, as well as out of town guests. Welcoming millions of visitors a year, Xfinity Live! has energized the Philadelphia Sports Complex via year-round events and experiences including concerts, festivals, family fun days, community functions, charity events and watch parties. For more information, please visit www.fusionarenaphilly.com.